I have recently been considering trying on leather crafting. I like how, by using certain types of leather, the items will age beautifully and get a personal patina. A couple of years ago I purchased an Atelier Pall iPhone case which I loved. Before that I had a couple of Sena cases. This got me started on getting other everyday items in quality leather, such as a Macbook sleeve from Mission Leather Co (Mintcases, at the time), a beautiful leather wallet from Joojoobs on Etsy and a small but very useful key pouch, also from Etsy. But now I felt it was time to try to create something myself. So while I wait for my tools to arrive, I ordered a bunch on Ebay, I thought I would give saddle stitching a try. 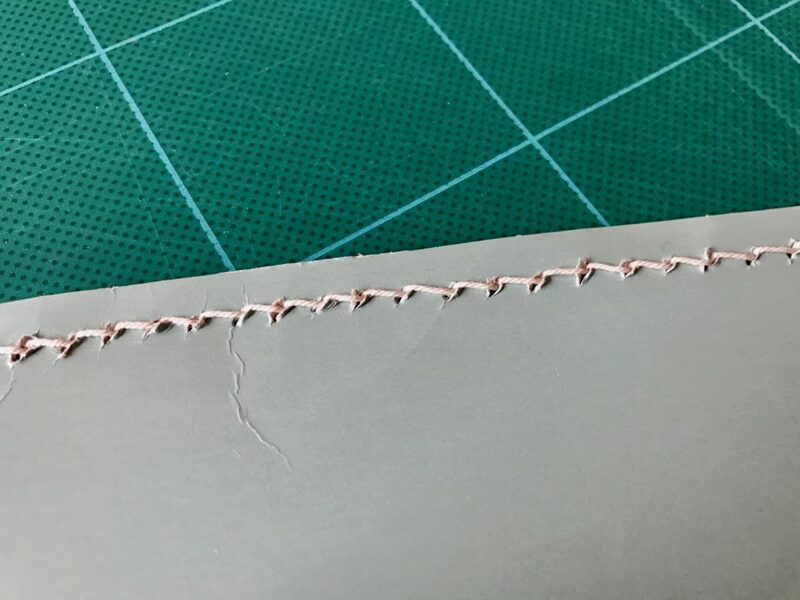 It’s a strong type of stitching you do by hand. Unfortunately I don’t have any real leather to practise on yet and no waxed thread. So I decided to use cotton thread, regular needles and cardboard instead. Not exactly ideal. Considering that, and that this was my first try after watching some videos on Youtube, I’m very pleased with the result.